Gov. 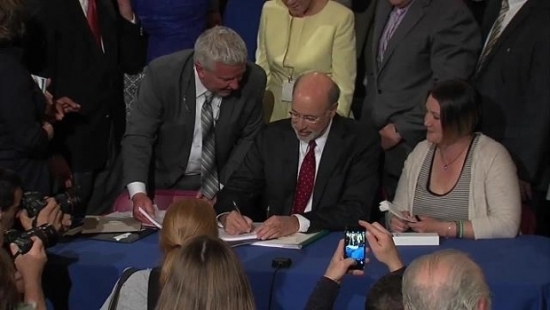 Tom Wolf has officially signed the bill to legalize Marijuana in Pennsylvania. The bill was approved last week by the house, and Gov. Wolf was more than eager to sign the bill saying, "This is a great day for Pennsylvania and a great day for Pennsylvanians." The bill will now allow physicians to prescribe marijuana to patients who need it. It will also allow tracking plants and growers to open in PA. Patients who can be prescribed will be able to use it in a number of ways, including pill, oil, vapor or liquid form but are not able to legally obtain marijuana to smoke or to grow their own. A Philadelphia man, Maurice Stephon Phillips has now been arrested for accidentally shooting and killing his 4-year-old stepdaughter on Saturday afternoon. The shooting happened in the home of the family on the 200 block of East Mayfield Street. The little girl was shot in the chest, and was pronounced dead at the scene. Phillips turned himself in for the shooting on Saturday night, and is facing many charges including, 3rd Degree Murder, an involuntary manslaughter. Police are on the search for multiple suspects after a police officer was shot last night in West Philadelphia. The police officer was chasing the suspects on 59th and Market Street after a car break in, when one of them opened fire on the officer. The officer retreated but ended up getting shot in the leg. The officer was taken to Penn Presbyterian Medical Center after being shot. It is unknown if the officer shot any of the suspects, and as of now no arrests have been made. UPDATE: The officer has been identified as 24-year-old Officer James McCullough. He is in stable condition and is expected to survive. The two suspects are now in custody, but have not yet been identified. Flyers play in Game 3 of the Stanley Cup Playoffs tonight at 7 at Home against the Capitals. Today, Clear and Sunny, with a high of 81 in Center City.